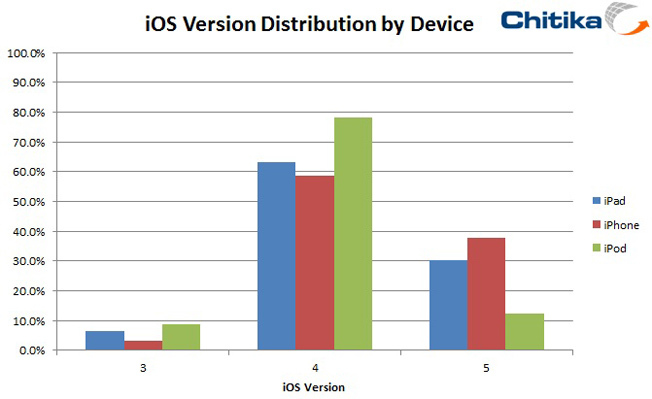 Chitika, an Advertising network, recently conducted a study to find out the iOS 5 adoption rate among iPhone, iPad, and iPod touch users. According to our data set, 38% of iPhone users had already updated their mobile devices to the latest version of iOS. The iPad came in second in our study with 30% of all users updating to or already using iOS 5. This is an interesting statistic as it illustrates the similarity of the iOS version distribution of both the iPad and iPhone. The iPod registered the smallest count of devices updated to iOS 5, with only 12% of users choosing to upgrade. This demographic is made further evident by the portion of devices running on older versions of iOS, with almost 80% of consumers using iOS 4.